Granite countertops are not only tough and durable—they look beautiful. However, granite, like all natural stone, is porous, so it must be sealed upon installation, and every year or two after that (see below). Otherwise, it can soak up oil and absorb stains from wine, juice, and other substances. With proper sealing, however, you'll find cleaning and disinfecting a snap. If you're a geology geek, you may already know that granite is igneous rock, formed during the slow cooling of magma, and mainly composed of quartz, feldspar, and other materials. Marble, meanwhile, is metamorphic rock, formed from limestone subjected to intense pressure and heat during tectonic shifts. Engineered stone is exactly what it sounds like: a manmade material produced by binding crushed stone (commonly marble and quartz) with an adhesive. Because of this, it isn't porous and therefore won't absorb stains or bacteria. Granite tends toward a speckled appearance, and it may contain a random variety of colors, while marble is of a single shade with veins in a different hue. Engineered stone is more uniform in color. Even though the granite has been sealed, this makes it stain-resistant, not immune. Immediately blot up all spills—especially wine, juice, and oil—so they don't have time to blemish the stone. Remember to blot stains rather than wipe them. You don't want to spread them across a wider surface and turn them into spots. Never use scouring powders or abrasive cleaners, keep harsh cleaners like bleach or ammonia away from the granite counter, and avoid cleaners containing acids like lemon and vinegar. Over time, these will all break down and strip off the sealant. Cleaning granite couldn't be simpler. Fill the sink with warm water and a little mild dishwashing detergent, wet a clean rag or dishcloth, and wipe down the counter. Rinse with clean water, then dry. Done. There are products on the market for doing a deep clean. Look for cleaners that are pH-neutral and designed for use with natural stone. Simply spray on and wipe dry with a paper towel or dry, lint-free cloth. If you feel soapy water is leaving streaks, you can buy a cleaner designed for natural stone. It is no better at cleaning than soap and water, but it has different agents in it to boost shine. And if over time you end up with a soapy film on the countertop, you can remove it with soap film remover. You can also find polishes for natural stone wherever countertops are sold. 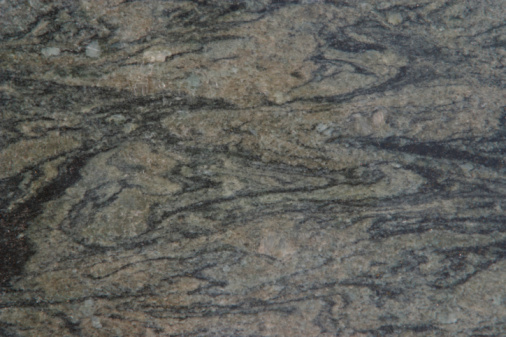 Granite comes in many shades, depending on its composition. 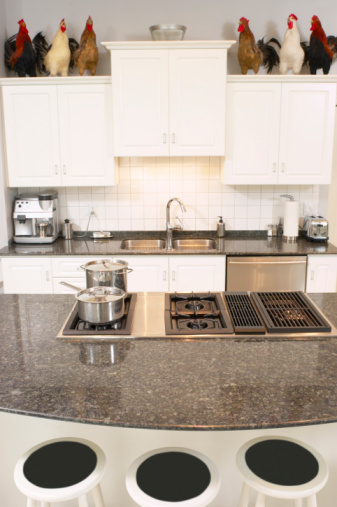 Because properly sealed granite is relatively resistant to bacteria, a soapy wipe-down is sufficient for daily sanitizing. But if you want to periodically disinfect more thoroughly, you can make a mixture of 50% water and 50% rubbing alcohol and put it in a spray bottle. Spritz it onto the countertop, wait three to five minutes, then rinse it off with clean water. Wipe the counter dry with a towel or cloth. Granite counters need to be resealed every year or two, using an impregnating stone sealer that contains a resin and a solvent. The solvent helps the sealer soak down below the surface of the stone, where the resin fills the pores of the stone to prevent absorption of other substances. The solvent then evaporates. Here's how to tell whether your granite counter is still sealed: Flick a few drops of water on it and leave them there a few minutes. If the water beads up, the sealer layer is still good. If the water soaks in, causing the granite to darken, it's time to reseal. Different brands of sealant will require slightly different methods, so follow the instructions on the package. But the basic process for sealing a counter remains roughly the same. First, clean and dry the countertop thoroughly. Wearing protective gloves, spray the sealant evenly onto the granite, or rub it in with a clean cloth. Allow the sealer to penetrate for the time recommended by product directions. Spray or rub on a second application, and leave it on for the recommended time. Use a dry microfiber cloth to wipe away any excess. Leave the surface undisturbed for the recommended time to let the sealant dry thoroughly. Ongoing maintenance takes mere minutes but granite countertop looking like new. If your granite countertop gets a stain, all is not lost! There are different methods to correct it, including a poultice or any of the other approaches listed below. Poultices are available for purchase—look for stain remover products for natural stone—or you can make one yourself. For purchased poultice, mix two parts poultice powder with one part water. It should have a consistency like creamy peanut butter; if it doesn't, keep adding either powder or water, as required. Apply it to the stained area, cover it with plastic wrap, and tape down the edges of the plastic with masking tape. (This is just so it doesn't get smeared.) Pierce the plastic wrap a few times with a pin or a tack so the poultice can dry. Leave it to harden overnight or up to 24 hours. Remove the plastic and scrape away the poultice with a plastic putty knife, spatula, or another soft tool. It may take several applications to remove tough stains. To make your own poultice, mix 1/3 cup of talcum powder with enough hydrogen peroxide to achieve a consistency a little thinner than peanut butter. Or, mix baking soda and water to the consistency of sour cream, or flour and hydrogen peroxide into a paste like peanut butter. Apply this homemade poultice as described above for purchased poultice. Remove oil-based stains, such as cooking oil, butter, margarine, cosmetics, etc., with pure acetone (not nail polish remover, which can contain different ingredients). Scrub organic stains, such as wine, coffee, soda, and mustard, with 12% hydrogen peroxide and a few drops of ammonia. Clean biological stains—mold, mildew, and the like—with diluted bleach or ammonia, in a ratio of 1/4 cup of chemical to 1 gallon of water. For ink stains, use acetone on dark granite and bleach or hydrogen peroxide on light stone. Rust stains may be impossible to remove. Use poultice on them. Gently buff out water spots with dry 0000 steel wool. Can You Use Simple Green on Granite Counters?